Mulching is one of the long known indigenous practices through which a farmer can increase agricultural productivity of his or her farm without spending huge sums of money. Among others, it helps to retain moisture in the soil, improves soil fertility by organic matter decomposition as well as suppressing the growth of weeds. Mulching involves covering the top soil with either a plastic film or dry vegetative material. 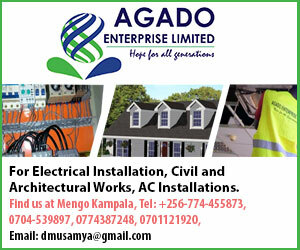 The commonest vegetative materials include; grass or plant residues, millet or maize stalks, coffee husks, rice husks, saw dust, banana pseudostems & leaves among others. The thickness of vegetative mulches is usually less than 6centimetres. Dry materials arising from diseased plants and plant tissues should be avoided as much as possible to minimise disease transfer. In Uganda, mulching is mainly applied inhigh value production of vegetable gardens, coffee, banana and young tree plantations. 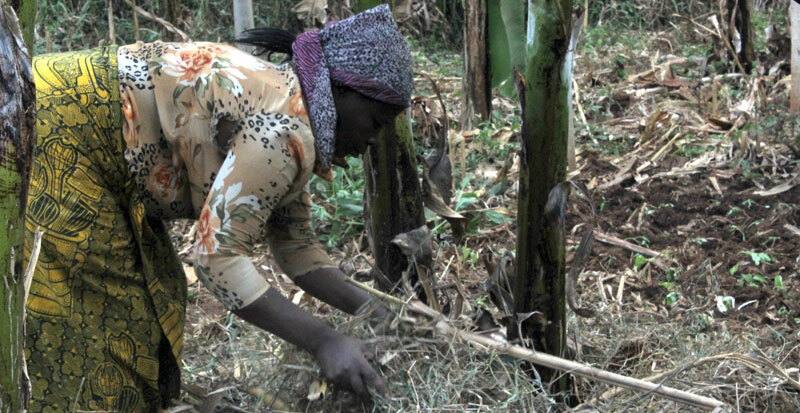 Due to their sensitivity to soil moisture deficiency, mulching has promoted the growing of tomatoes and bananas in different parts of the Uganda. Mulching increases the biological performance of micro-organisms such as earthworms in the soil. These organisms make in-roads (barrows) underground, hence increasing plant root development, breaking hard soil pans, improving soil aeration, organic matter decomposition, soil water infiltration, and increasing plant nutrient absorption among others. Mulching materials inhibit and suppress the growth of weeds such as pig weed and black jack on the soil surface which would otherwise compete with plants or crops for nutrients and sunlight, hence lowering yields. Mulching increases the efficiency of fertilisers and soil water by minimising their depletion from the soil. This reduces application frequency of fertilizers such as Urea, NPK or CAN and increases nutrient absorption since the required soil moisture is readily available. The mulching materials tend to hold soil particles together, increase resistance to surface water run-off and lower the occurrence of soil erosion through run-off or wind action. Also, mulch materials lower the impact of rain drops striking the ground. This prevents dislodging of soil particles which would otherwise lead to splash erosion. Mulching enables crop production during dry spells when there would otherwise be little or no production. As a top soil cover, mulching materials minimise loss of moisture from the soil interior to the atmosphere, increasing plant resilience and ensuring adequate moisture levels to sustain and propel plant growth. Mulching materials, through their resistance to run-off, increase the retention time of water on the soil surface, eventually improving water infiltration and movement into and around the soil. By binding soil blocks together, mulching improves on the structural arrangement and performance of the soil, minimising soil depletion and making it more productive in the longer term. Grass mulching material used to cover the top soil eventually decomposes into organic matter. This improves soil aeration, structure, nutrient availability and water holding capacity among others. * Farmers practicing mulching must ensure that the material being employed is dry and past the vegetative stage to improve on its decomposition and minimise chances of regrowth to become weeds. Weeds that find their way and grow through the mulch should immediately be uprooted using hands, detach any soil particles on its roots and spread atop the mulch to dry and become part of the mulch. * No hand hoes or other gardening tools except for pairs of human hands should be used to uproot or attend to weeds in a mulched garden. This reduces soil and plant disturbance. * In the event that mulching is done during the rainny season or with partially dry or moist plant materials, efforts should be made to periodically turn the mulch materials until they are appropriately dry. * The garden to be mulched should first be ploughed and cultivated to the required final tilth to reduce disturbances after mulching. *The mulch should be spread on the field before planting either with seeds or seedlings to minimise disturbances. * Where the mulch materials are inadequate to cover the entire field, only areas around the plant should be mulched to increase moisture conservation around the plant and promote stronger root development and vigorous plant growth. * For sloping fields, mulching should be done from the upstream to avoid eventualities of inadequate mulch material availability and drastically lower run-off that builds up with the increase in slopes. * Usually materials that can easily decompose within a growing season should be promoted so that they can easily be ploughed and mixed with the soil after harvesting in preparation for the next planting season. * Locally available dry materials are encouraged to be used for mulching to minimise costs of production and maximise potential benefit. * Lighting fires or smoking in the mulched field should be avoided as much as possible. * The boundaries surrounding the mulched field should have live hedges and ploughed grounds to prevent fires from spreading from neighbouring areas. * Dry thorny plant residues and materials should be avoided as these inflict damage and injuries to humans, animals or machinery deployed onto the field during and after mulching.